AIDS (acquired immune deficient syndrome) is a deadly human viral infectious disease caused by HIV (human immune-deficient virus) infection. Almost every AIDS patient losses his/her life before mid 1990s. AIDS was once the 1st disease killer in US (1993). After one decade hard work, antiviral drug cocktails-high active anti-retroviral therapy (HAART) have been invented for almost all HIV infection treatments. Due to the invention of HAART, 80-90% HIV/AIDS patients still effectively response to HAART for deadly AIDS episode controls and life saving. Yet, this type of HIV therapeutics is incurable. HIV/AIDS patients need to take HAART medications regularly and even life-long. To counteract this therapeutic drawback, more revolutionary efforts (different angles of therapeutic modes/attempts) are urgently needed. 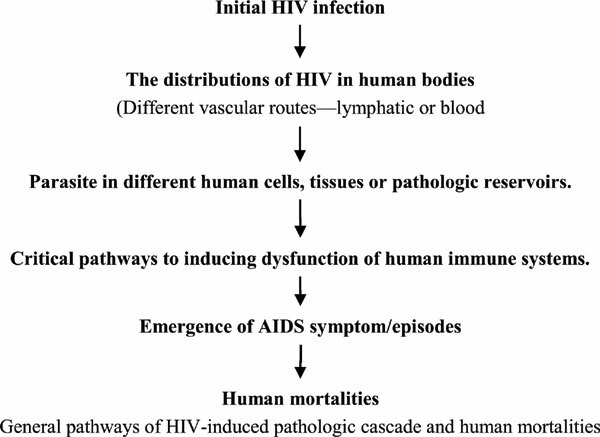 In this article, the major progresses and drawbacks of HIV/AIDS chemotherapy (HAART) to HIV/AIDS patients have been discussed. Future trends (updating pathogenesis study, next generations of drug developments, new drug target discovery, different scientific disciplinary and so on) are highlighted. Keywords: HAART, antiviral therapy, HIV cure, drug delivery system, medicinal chemistry, HIV latency, HIV reservoirs, integrase inhibitors, pharmacogenomics, biotherapy. Keywords:HAART, antiviral therapy, HIV cure, drug delivery system, medicinal chemistry, HIV latency, HIV reservoirs, integrase inhibitors, pharmacogenomics, biotherapy. Abstract:AIDS (acquired immune deficient syndrome) is a deadly human viral infectious disease caused by HIV (human immune-deficient virus) infection. Almost every AIDS patient losses his/her life before mid 1990s. AIDS was once the 1st disease killer in US (1993). After one decade hard work, antiviral drug cocktails-high active anti-retroviral therapy (HAART) have been invented for almost all HIV infection treatments. Due to the invention of HAART, 80-90% HIV/AIDS patients still effectively response to HAART for deadly AIDS episode controls and life saving. Yet, this type of HIV therapeutics is incurable. HIV/AIDS patients need to take HAART medications regularly and even life-long. To counteract this therapeutic drawback, more revolutionary efforts (different angles of therapeutic modes/attempts) are urgently needed. In this article, the major progresses and drawbacks of HIV/AIDS chemotherapy (HAART) to HIV/AIDS patients have been discussed. Future trends (updating pathogenesis study, next generations of drug developments, new drug target discovery, different scientific disciplinary and so on) are highlighted.